If you are looking for organic vegetable seeds for your food garden, these vegetable seed companies should get you started. Seed quality makes a huge difference in growing plants from seed, whether flowers, herbs or vegetables. Unfortunately, the seeds you find on seed racks at the local big box store, or sometimes even at nurseries, are often of low quality. As with so many things, you get what you pay for. If you have a local seed company, try their seeds: swap with your local experienced seed-saving gardeners; save your own seed: and try some of these mail-order vegetable seed companies. Mail order seed companies often offer seeds that you cannot find in retail stores at all. They can also focus on seeds for a specific region, or heirloom seeds, organic seeds, or native seeds, something which it's not often economic to do for companies supplting seed racks and packets to retail stores all over the country. While this page lists mostly larger vegetable seed companies, there are many, many small seed producers and mail order sellers all over the world who produce a limited range of seeds tailored to their region. Local garden shows or seed exchanges may give you access to them, and they often have small websites. Searching online for "seed company" + your region will probably bring up multiple possibilities for you to research. If you find a company that looks good I suggest buying a limited selection of seeds from them to start with, to check out the quality, before you commit a large part of your growing season and garden space. While some companies will mail seeds outside their own country, it's often easier to order seeds from your own country. The US is so large, with so many different climate zones, that it's also important to order from a company that carries seeds for your region. Park Seed: Seeds and plants for vegetable, flower, annual and perennial gardening. "Seeds and plants for every gardener in every area of the US. We sell the largest selection of vegetables, flowers, annuals, and perennials.". Park seed are located in South Carolina and carry especially good varieties for the US South. "Seeds, plants and supplies for home gardeners. Large, exclusive selection of vegetables, perennials, annuals, herbs, and bulbs." Burpee is located in PA and have a long history of plant breeding and developing new varieties which have stood the test of time. "Vegetable seed, Flower seed & Herb Seeds for sale." Territorial was started as a regional seed company by Steve Solomon and teh current owners, Tom and Julie Johns, continue that tradition. The catalog focuses on varieties which do well in our often capricious weather (yes, I'm in the same region, up in BC, Canada) and also has a good selection of seeds for winter food production here. US caustomers can also buy started plants of Territorial varieties which you can't find in local nurseries. "Heirloom Garden Seeds. Vegetables, Flowers & Herbs! All Non-Hybrid & Non-GMO Seeds! We offer Free Heirloom Seed Catalog and have retail seed stores." With their main office located in MO, and stores in CA and CT, these guys concentrate on heirloom seeds, as their name states. 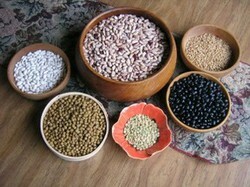 A good selection of seeds for the US South - for example, 32 varieties of cowpeas! "Johnny's is committed to helping growers and gardeners succeed with superior seeds, tools and service. Quality vegetable, herb and flower seeds including a large selection of certified organic seed." This company breeds their own varieties and is an excellent source for short-season beans, corn etc. which are adapted to their local US Northeast area, but also work well for some other short-season locations. High quality seed, very reliable. Many people in Canada order from the big US seed companies without realizing that they could get varieties which are better adapted to their area by byting from Canadian companies. West Coast Seeds specializes in organic, open pollinated, heirloom and heritage seeds for organic growing. With over 500 varieties of untreated seeds to choose from, you will find what you are looking for. The main catalog containes an extermely useful planting chart for the region. Winter vegetable seeds are also a specialty, and a winter-specific planting chart is available from the website. Stokes Seeds is a North American distributor of flower, vegetable, herb and perennial seeds to commercial growers and home gardeners. While most of the varieties are not region-specific, because Stokes sells the same seeds to commercial growers and home gardeners, the seed quality is excellent. "Supplying Quality Seeds, Organic and Untreated for Northern Climates." William Dam is located in Ontario and they carry a good line of seeds which work well for northern short-season areas. "Heritage and Heirloom Seed Catalog for Organic Gardeners from Salt Spring Seeds. Tomatoes, Quinoa, Amaranth, Oats, Soybeans and more. 2011 is Salt Spring's 24th year of supplying seeds to farmers and gardeners, promoting organic growing, and encouraging people to save their own seed." Seeds are locally grown by a network of gardeners and farmesr on Salt Spring Island, and are very well adapted to the BC Coast climate. Salt Spring Seeds also sponsors the Seed and Plant Sanctuary for Canada. "Veseys prides itself in offering you the best in seeds, bulbs, roses, gardening products and outstanding customer service. Our online catalogue contains all of the great products available in our printed catalogues, all backed by our satisfaction guarantee!". I've had good results with Veseys seeds although I have also experienced numerous errors with orders - which get cheerfully fixed, but are frustrating. "Seeds and Plants for the Vegetable and Flower Gardener from Thompson & Morgan". T & M are one of the biggest, if not the biggest, seed companies in the UK and their catalog features an amazing array of beautifully photographed flowers, as well as a good vegetable selection of UK-specific varieties. They also have a North American catalog and web site that US and Canadian gardeners can order from, if UK-adapted seeds are likely to be appropriate in your garden. "Fresh seeds of around 4500 species and varieties, many rare and unusual." They are not kidding about the unusual! For example, a featured seed collection is of curry flavorings, including cumin, basil, ajmud, ajwain, and more. "Suppliers of Flower seeds, vegetable seeds, flower plants, vegetable plants, seed potatoes and perennial plants." Includes a range of organic seeds, and a special section of "speedy" varieties. Most countries have an organization which encourages and supports seed saving by gardeners, and often allows them to swap seeds. Since 1975, Seed Savers Exchange members have passed on approximately one million samples of rare garden seeds to other gardeners. We are a non-profit organization of gardeners dedicated to saving and sharing heirloom seeds. Canada's Heritage Seed Program - a non-profit group of gardeners who save seeds from rare and unusual garden plants for the purpose of preserving varieties. Seeds of Diversity also sponsors the Seedy Saturday seed exchange days in the spring which happen in communities across Canada. The Heritage Seed Library works to safeguard rare vegetable varieties, that were once the mainstay of British gardens. Members can grow up to 6 rare varieties each year. This is the seed-saving arm of the Henry Doubleday Association, now called "Garden Organic, the national charity for organic growing". Because of EU seed regulations, many heritage vegetable variety seeds cannot be legally sold, and are maintained by volunteer seed savers and sharers. What's your favorite seed source? Tell me and I'll add it to the appropriate list. I'd have to say Burpee was my favorite company.